CASE REPORT: Abatement of right leg radicular clinical signs and symptom in a 58-year-old male with advanced degenerative disc disease, disc bulging and grade II spondylolisthesis using a comprehensive approach to care including multiple modalities..
Abatement of right leg radicular clinical signs and symptom in a 58-year-old male with advanced degenerative disc disease, disc bulging and grade II spondylolisthesis using a comprehensive approach to care including multiple modalities, non-surgical spinal decompression and chiropractic care. Abstract: Objective: To examine the diagnosis and care of a patient suffering from chronic low back pain with associated right leg pain and numbness. Diagnostic studies include standing plain film radiographs, lumbar MRI without contrast, chiropractic analysis, range of motion, orthopedic and neurological examination. Treatments include both manual and instrument assisted chiropractic adjustments, ice, heat, cold laser, Pettibon wobble chair and repetitive neck traction exercises and non-surgical spinal decompression. The patient's’ outcome was very good with significant reduction in pain frequency, pain intensity and abatement of numbness in foot. 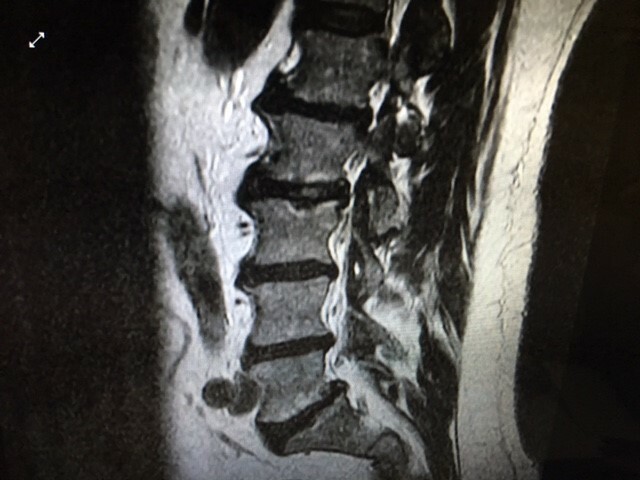 Keywords: degenerative disc disease, spondylolisthesis, chiropractic adjustment, Pettibon wobble chair, cold laser, non-surgical spinal decompression, nerve root compression, lumbar radiculopathy. Clinical findings: Posture analysis revealed a high left shoulder and hip with 2 inches of anterior head projection. Bilateral weight scales revealed a +24 pound differential on the left. 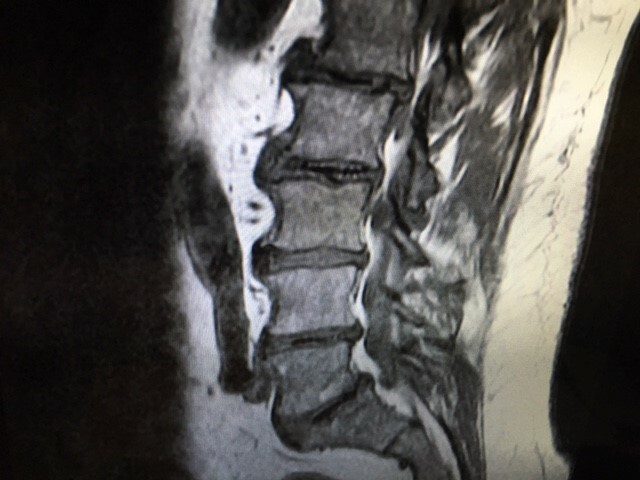 Weight bearing dysfunction and imbalance suggest that neurological compromise, ligamentous instability and or spinal distortion may be present. Range of motion in the lumbar spine revealed a 10 degree decrease in both flexion and extension. There was a 5 degree decrease in both right and left lateral bending with sharp pain with right lateral bending. Definition – Radiculopathy: Sometimes referred to as a pinched nerve, it refers to compression of the nerve root - the part of a nerve between vertebrae. This compression causes pain to be perceived in areas to which the nerve leads. 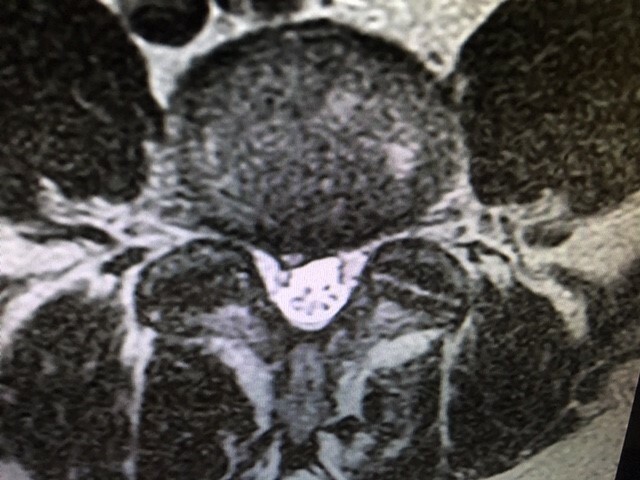 Discussion: It is appropriate to immediately order MRI imaging with radicular pain and numbness. Previous health providers who did not order advanced imaging with these long term radicular symptoms are at risk of missing important clinical findings that could adversely affect the patient’s health. The increasing managed care induced trend to forego taking plain film radiographs is also a risk factor for patients with these problems. Warm up tissues for mechanical therapy through increasing blood flow.